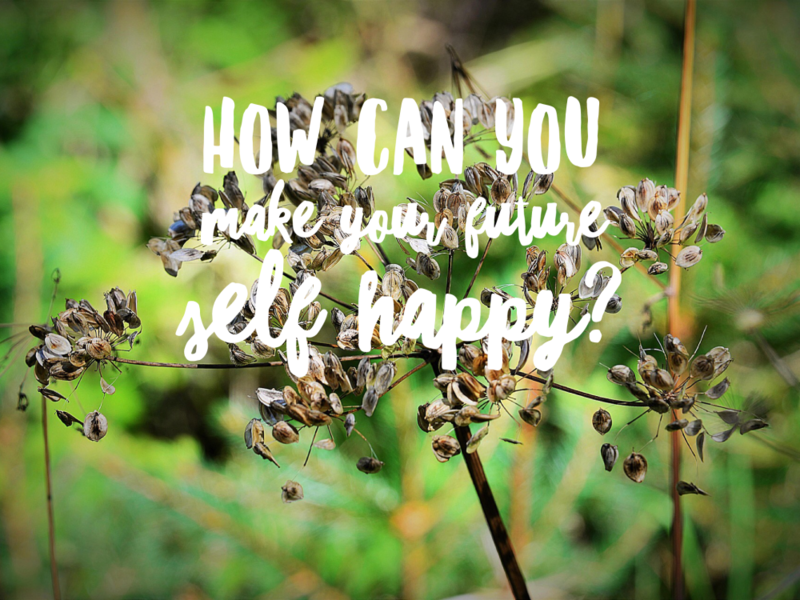 Happiness Hack – make your future self happy! Hello! This is the first in a series of articles about Happiness Hacks – simple ideas we can all put into practice to help us lead happier lives. This first one is concerned with happiness for our future self. My future self has been part of my thinking for some time. When I was training to be a life coach, we came across the idea of visualising and consulting with your future self. This was a version of you, many years in the future, maybe 20 years, who you could seek guidance and support from. I’ll do a separate article on that idea another time, but it’s a really powerful exercise and something I have used with many clients over the years. Anyway, I recently listened to a podcast where the future self was talked about so I pricked up my ears to listen closer – only this time, this was not a version of you far away in the future, it was you tomorrow, or next week, or next month. The podcast encouraged the listener to think of ways we can be helpful or kind to this version of our future self by doing things TODAY. (By the way the Podcast was part of the Happier series with Gretchen Rubin and Elizabeth Craft and I really recommend it). I was really encouraged by this idea because it’s something that I do myself but I hadn’t really thought about it as a process or really something I could encourage others to do. So I hope that in writing this article, you will adopt the idea and your life too can become a little easier. Every night, before bed, I do the following things for my future self – in this case, me, tomorrow, to make her life easier. I set up tea mugs with teabags in and a spoon. I fill the kettle. I set the breakfast table with the cutlery required. I sort and place Dom’s coffee pot on the stove. (Ok, this is for future Dom but believe me, future Sarah doesn’t like future Dom without his early morning espresso!). I also sort what we are having for breakfast and if it’s something that can be done in advance (like pancake batter, baked oatmeal etc) I do whatever stages can be done and put in fridge/ cupboard. I get my morning pages journal and my laptop and headphones out and on the coffee table and I make sure a pen or pencil is to hand. And I am all set. I can’t tell you how much easier this makes my morning. If I came downstairs and had to find mugs and spoons and worry about fitting in making breakfast I would likely cry. All of this takes a maximum of ten minutes, it’s probably more like 5 if breakfast food prep is minimal and it’s SO helpful and essentially really, to the running of the next day. I also think of future Sarah when I’m tempted to stay out too late, or when I want to skip my daily exercise routine. Somehow thinking of the effect that my poor behaviour will have on me tomorrow, or next week or next month, makes it easier to stick with more positive actions. So how can this apply to you? Well, firstly, look to the areas of your life that you feel a bit dissatisfied with. Are you always in a rush in the morning? Do you frequently run out of clean clothes? Is everything you need for the day at hand in the morning or are you scrabbling round for the right coat or your phone a minute before you’re due out of the door? Do you regularly sacrifice sleep for reading or watching TV and then feel tired out? Are weekends full of chores that you failed to do in the week? Do you mean to walk part way to work but end up getting the bus? Have a think about your future self and how you can be kind to her or him. What do they need from you today? And then start to create some habits and rituals that will help you to help them. And if you’re not currently on my mailing list, see the link below to sign up!